If your child ingested a button battery and suffered a severe injury, a lawsuit against the manufacturer of the toy or device may be warranted. If the doctor or emergency room misdiagnosed your child’s condition, then a medical malpractice lawsuit may be in order. McEldrew Young has the team of Catastrophic Injury Attorneys to investigate and litigate your case involving a battery injury. Call 1-800-590-4116 to speak to one of our trial lawyers as part of a free, initial legal consultation. Button batteries are small and shiny and increasingly present in children’s toys and small electronics. If there is a product defect or a design flaw with the device, a child may gain access to one and swallow it. Ingestion of more than 3,000 button batteries in the United States every year results in a trip to the Emergency Room. When a child ingests a button battery, their symptoms could be virtually absent or similar to those of a common infection. This makes it challenging for health care professionals who are evaluating the child. When a button battery is placed in the nasal cavity or the ear canal, drainage or pain may be noted, which is not unique to button batteries. Non-specific symptoms combined with an unwitnessed placement can lead to a delay in diagnosis and even greater injury. Batteries that are lodged in the nasal cavity can cause nasal mucosal injury, periorbital cellulitis, scar tissue formation and nasal septal perforation. Injuries in the ear canal include hearing loss, tympanic membrane perforation, and facial nerve paralysis. When a buton battery is lodged in the body, the electric current in a button battery rapidly increases the pH of the tissue adjacent to the battery, causing significant tissue injury even within two hours. Esophageal button battery injuries can include esophageal perforation, mediastinitis, vocal cord paralysis, tracheoesophageal fistula, esophageal stricture, or death caused by a significant hemorrhage of an aortoesophageal fistula. Product Defect – Children should not be able to remove batteries from devices that are properly packaged and have safeguards against opening the battery compartments. If there is a defective design, a lawsuit against the toy or electronics manufacturer may be warranted. 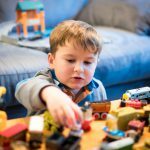 Failure to Warn – Toys have warnings about their appropriateness for different age children for a reason. If the product was packaged without a warning about possible ingestion, and harm resulted, a jury may find that the company was obligated to warn users about the potential issue. Medical Malpractice – If a child is taken to the emergency room after swallowing a battery and the doctor misses the diagnosis, serious injury can result. An x-ray usually provides conclusive evidence of the ingested battery. If the doctor or ER staff’s conduct fell below the acceptable standard of care, a malpractice lawsuit may be viable. If your baby or small child has swallowed a button battery and suffered an injury or fatality, contact our team of lawyers at McEldrew Young today by filling out our form or calling 1-800-590-5151.